The Toronto Real Estate Board announced that there were 7,656 condominium apartment transactions in the second quarter of 2015, representing a year-over-year growth rate of 17% relative to Q2 2014. Sales growth greatly outpaced growth in listings, with new listings up by a lesser rate of 7.3% year-over-year and active listings at the end of the second quarter down by 1.3%. “Much of the new condominium apartment inventory that has been brought to bear on the market in the recent past has been absorbed. In fact, market conditions have tightened with months of inventory trending lower. This suggests that recent condominium apartment completions, while strong from a historic perspective, simply helped satisfy a growing demand for this housing type. 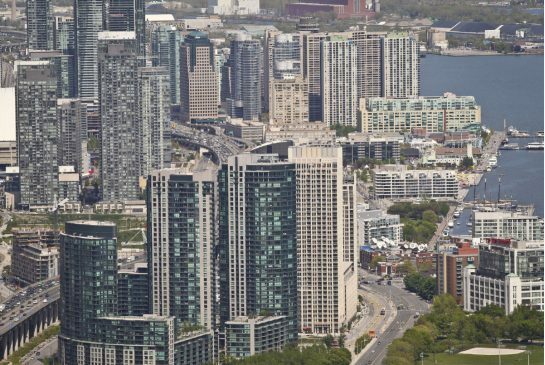 Absorption rates and price growth statistics point to a healthy market,” said TREB President Mark McLean. The average selling price for condominium apartments in the TREB market area as a whole grew by 5.8% year-over-year to $388,066. In the City of Toronto, which accounted for 70 per cent of sales in the GTA, the average selling price of $416,728 represented a 6.1% increase compared to Q2 2014. “Condominium apartment prices have been appreciating at a moderate pace, on average, over the past year, especially when compared to low-rise home types like detached and semi-detached houses and townhouses. However, it is possible that we could see an acceleration in condo price growth in the second half of this year, as growth in sales remains strong relative to growth in listings,” said Jason Mercer, TREB’s Director of Market Analysis.